Trogir is a beautiful, ancient town located at the northern shores of the Kastela Bay. The old town of Trogir is actually situated on a small island settled in a narrow space between the mainland and the Island of Ciovo. One bridge connects the Old Town with the mainland and the other bridge leads to Ciovo. The immense cultural and historical heritage of Trogir is enough to make it one of the most desirable tourist destinations on the Adriatic. 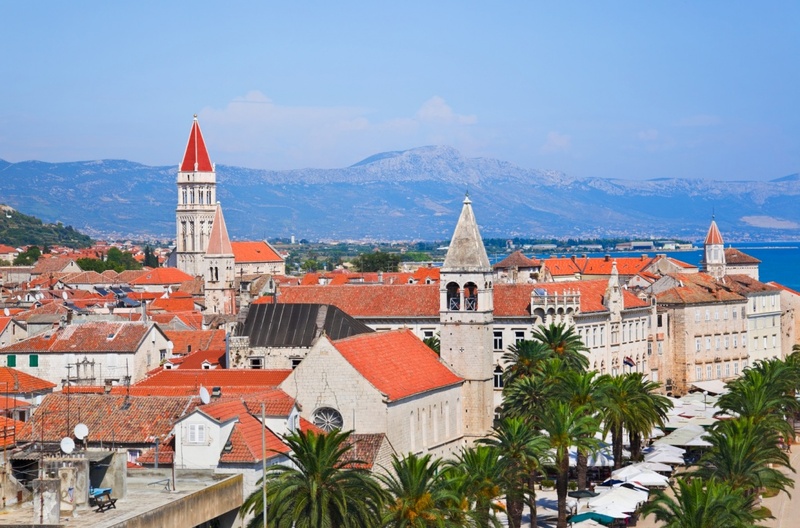 However, apart from its amazing monuments Trogir is also famous for the breathtaking coastline with beautiful beaches, friendly locals, tasty cuisine and excellent service wherever you go. The legends and history of Trogir go back 2300 years to the prehistoric times when the Greek colonists founded the settlement Tragurion. Since then Trogir changed many inhabitants and rulers, every culture and civilization leaving its indelible trail in stones of the Old Town. Since the ancient times, over the medieval period, the Venetian rule and Austrian dominion, all the way to the modern times, Trogir kept and nurtured its unique beauty and tradition until the present day. It is said that the Old Town of Trogir is one big museum. With its narrow, stone covered streets filled with historical monuments and surrounded by the medieval walls and forts, Trogir is considered to be among the best preserved late medieval towns in the Middle Europe. The historical core of the city is UNESCO protected. Whether you decide to take a guided tour or a simple walk between the city walls, you should pass through the main city gate and let the stream of people lead you to the main city square. There you can admire the magnificent cathedral of St. Lovro with its famous Portal of Radovan and the adjacent bell tower. The city walls are overlooked by two medieval forts: Kamerlengo and St. Marcus, and filled with numerous beautiful palaces. Trogir is only 5 km away from the Split airport and 25 km away from the center of Split. Due to its protected position, Trogir is a beloved destination of yachtsmen. The old city harbor is almost exclusively reserved for the mega-yachts; but there are three marinas available for smaller boats: ACI marina, Agama and Ziroma. It is easy to find quality accommodation in Trogir; there are several family-run hotels, bed and breakfasts as well as private apartments and rooms, camps and villas. Previous visitors recommended Hotel Tragos and Villa Sveti Petar as excellent accommodation options. Trogir restaurant scene is something you shouldn't miss. Mixing the historical and cultural influences, the Dalmatian cuisine is based on fresh fish and seafood, lots of olive oil, Mediterranean herbs and praised local wines. Try some of those delicacies in the authentic Dalmatian atmosphere of beautifully designed restaurants and taverns such as Kamerlengo, Alka or Bokun tavern. Trogir has one nightclub, F1 and numerous lounge and cocktail bars. It is interesting that Trogir was the first European city to have a pharmacy. It was opened in the 13th century. Perhaps the best example of universal recognition for the Trogir's charm and magical beauty are the scenes that crew of the cult science-fiction TV series Doctor Who came to film here during the winter of 2009. Find information about selected Hotels, apartments and rooms in Trogir to choose the perfect place for your accommodation.